Be the life of the party anywhere with the convenient scissor cart grill. The TQ285X’s all terrain wheels roll over anything with ease, and it folds down and opens up with a quick lift and pull. Set up for your tailgate, or picnic. Hang the cart on the wall for easy storage, or pull it along with you when you travel. The cart features spacious side shelves for prep and integrated towel and tool holders too! 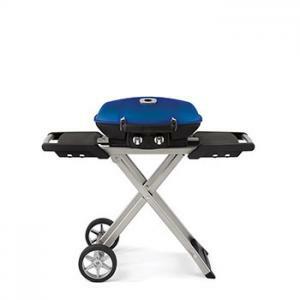 Everything you need for successful grilling on the go.